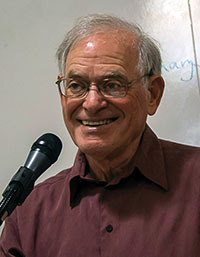 Peter Neil Carroll has taught creative writing at the University of San Francisco, taught history and American Studies at Stanford and Berkeley, hosted “Booktalk” on Pacifica Radio, and edited the San Francisco Review of Books. He has published over twenty books, including the memoir, Keeping Time (2011) and his poems have appeared in The Aurorean, Catamaran Literary Review, Cultural Weekly, Sand Hill Review, Southern Humanities Review, Tar River Poetry Review, and Verse Daily. He is currently Poetry Moderator of Porside.org and lives in northern California with the writer/photographer Jeannette Ferrary. In Elegy for Lovers, Peter N. Carroll explores the roads not taken. Willie, his alter-ego, and Willie’s doomed lover, Maureen, are the travelers, happiness, the illusive prize. The poet has the upper hand until these persistent characters come alive, override his literary choices, and force Carroll to come to grips with what could have been. 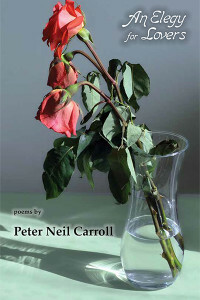 A masterful collection by a poet with a probing mind and a delicious imagination. ~Alexis Rhone Fancher, author of ENTER HERE, poetry editor of Cultural Weekly. or meet trouble to last a lifetime. be surprised I make this admission. I invented but isn’t mine. of a man-child he never knew he had. The news destroys dreamless sleep. with the child’s mother, Maureen. years without her feel like exile. and who am I to judge? liberating paths I’ve not taken. I’m old enough to know better. they’re doing. Not bad, I reply. So many lives are hard to juggle. pieces. I had to put them to rest. anxious to disguise their quirks. decided he was gay, left the closet. I invite my wife to look at Maureen. Not a memoir, I assure her. Pure fiction. Questions that set the writer to ponder. about my body in public. and that other couple the McIntyres. Before the kids could swim.